Looking to improve your spatial reasoning skills? With this free spatial reasoning test you will familiarise yourself with the format and questions types you will encounter on the day of the actual test. Sign up to gain access to additional spatial reasoning preparation materials once you have taken the free test for a spin. Our free spatial reasoning practice test is designed thus giving you an idea of what we offer you for your test preparation. 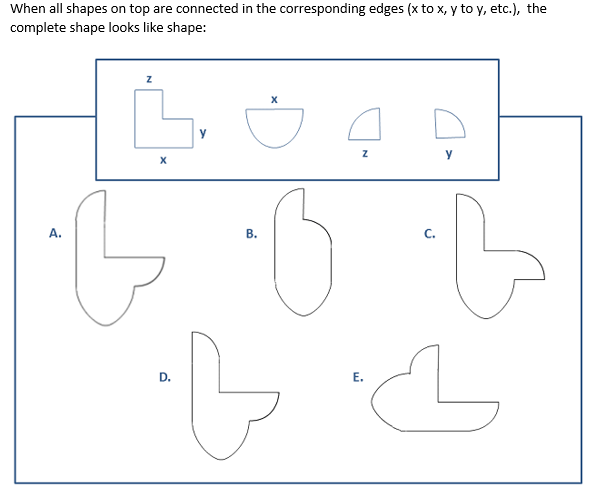 Our free test includes 15 spatial reasoning questions and answers. As well as this, you get full answer explanations to stimulate your learning process. Access our free spatial test by clicking on the button above. Once you have completed the sample test you will be able to review your answers to get an idea of where your skills truly lie. 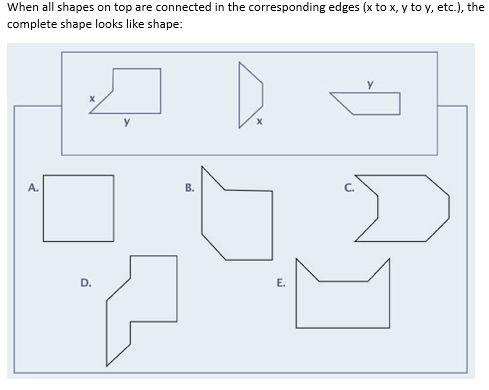 Below you will find some spatial reasoning sample questions taken directly from our free test. Remember that the purpose of a spatial reasoning test is to evaluate your spatial visualisation, mental folding and mental rotation abilities, as well as your spatial and visuospatial function. The questions below are very similar to questions you are likely to encounter when taking this sort of test. If you are looking to improve your spatial reasoning abilities and test scores, look no further. Our exclusive spatial reasoning PrepPack™ includes everything you need to pass your test. From practice tests to study guides with full answer explanations, we have got you covered. Start practising today to pass your spatial reasoning test. Taking a spatial reasoning test can be nerve-wracking if you aren’t sure what to expect. Below you will find several useful tips to passing this type of test. Practise makes perfect. Our comprehensive spatial awareness test packs were designed to include everything you need to pass your test. Making use of our practice tests, study guides, and answer explanations will undoubtedly help improve your overall test scores. Remember that the higher you score on the spatial reasoning test, the better your chances will be of getting hired. Keep in mind the time. Spatial reasoning tests are often given under different and difficult time constraints. This means that you will only be given a set amount of time to answer each question. Practising beforehand improves your ability to answer each question in time. The more practise tests you take, the quicker and more confident you will be when you come to take the real thing. Relax. There is no quicker way to get through something than with a perfect calmness. As long as you have practised properly and carefully, you will have to skills required to pass the test. You will be able to relax in the knowledge that you have done everything you can to prepare. You will be able to view your spatial reasoning test as merely a affirmation of your preparation. The best way to prepare for this and any test is to practise beforehand. We have created a wide range of online preparation materials to give you an edge throughout the recruitment testing process. By signing up, you will gain access to dozens of practice tests with in-depth study guides and answer explanations to boost your learning process and ultimately pass the test. Are you looking for a different test? We offer in-depth preparation materials for abstract reasoning, deductive reasoning, inductive reasoning, diagrammatic reasoning, and more. Start practising to boost your confidence and chances of success.